Here’s a quick tip as you prepare for your upcoming dance performances. We all know it’s important to keep hats and hair accessories looking their best. If your dancer has a hairpiece such as a bow or flower, placing them in a garment bag will flatten them especially if it has other costume garment bags on top of it. We use a medium size round tupperware container to hold any hair accessory that isn’t something as simple as a clip. As for hats, my favorite tote I’ve found is a rectangular box that clips on the sides. 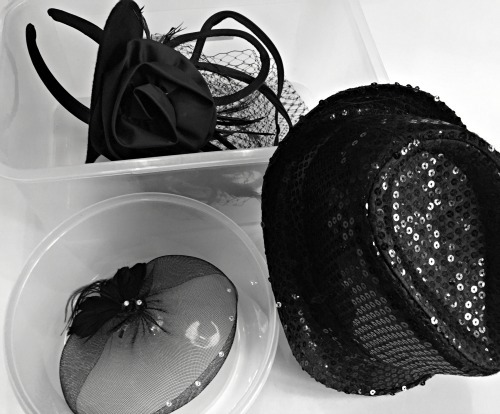 I’ve noticed over the years, that a lot of dancers choose not to pack their hats and carry them in separately. Not that you can’t do that, but if you are looking for a way to store all of your items in one place, there is an easy solution. No need to go buy a fancy hat box to protect your hat(s). A plastic container will do the trick. You can find containers like these at Wal-Mart, Target & Amazon. We use a Dream Duffel and after packing the costumes, we simply place the two containers on top and away we go. What storage solution works for you?